WHY&apos;S CRIME FALLING? True, Chicago&apos;s homicide rate is up. 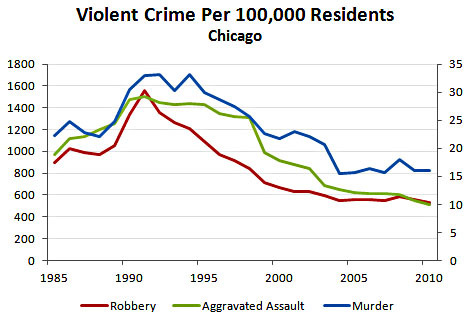 But, in many of the nation&apos;s big cities, violent crime is in spectacular decline. Writing in Mother Jones, Kevin Drum examines evidence the most significant factor may have been the elimination of lead, especially from gasoline. In a postscript, Drum says, even with the homicide spike, "the big picture in Chicago is similar to the big picture in every other big city in America: violent crime is down." OBAMA TWOFER. The president&apos;s set today to name a new Defense Department chief and a new CIA boss. PHOTO FINISHED. A Photoshopped image of the 2013 club of women serving in the U.S. House has sparked an ethical debate between professional news photographers&apos; groups and Minority Leader Nancy Pelosi. CHILLING NEWS. Quantum physicists have cooled potassium gas to a temperature below absolute zero. The paradoxical result? Something hotter than the sun. Ira Flatow explained on Science Friday. WHAT&apos;S NEXT. Will NHL hockey officially return in 2013? Will anyone care? (In Chicago, this online poll suggests, yes.) ... Will Illinois lawmakers do anything about the state&apos;s pension crisis? Apparently off the table: gun control and medical marijuana. ... A fresh batch of general-public tickets goes on sale today for The Book of Mormon, extended through Sept. 8. (Can anyone remember another time when an ad wrapped the entire front section of the Trib? UPDATE: A source within the Tribune organization says this is not the first time the paper&apos;s front section has been wrapped fully by an ad, as it was today.) ...Will state Rep. Deborah Mell get the City Council seat of her dad, Richard Mell? She&apos;s playing it down, but not ruling it out. ... Ex-U.S. Rep. Joe Walsh, a Tea Party darling defeated in the fall, speaks Wednesday to the Chicago Tea Party. (Yes, there is one.) Will he tip his hand on a run for governor or senator, or an attempt to regain his congressional seat from Tammy Duckworth? ... The Consumer Electronics Show begins in Las Vegas tomorrow. This is the first edition of a new WBEZ blog. It&apos;s an honor to be here, but it won&apos;t be fun if you&apos;re not along for the ride. Don&apos;t miss a thing: Sign up for WBEZ email alerts. And check back here often. To make sure you&apos;re paying attention, there will be quizzes. Like this one. Music that helped get this issue out the digital door: Pandora R.E.M. mix.